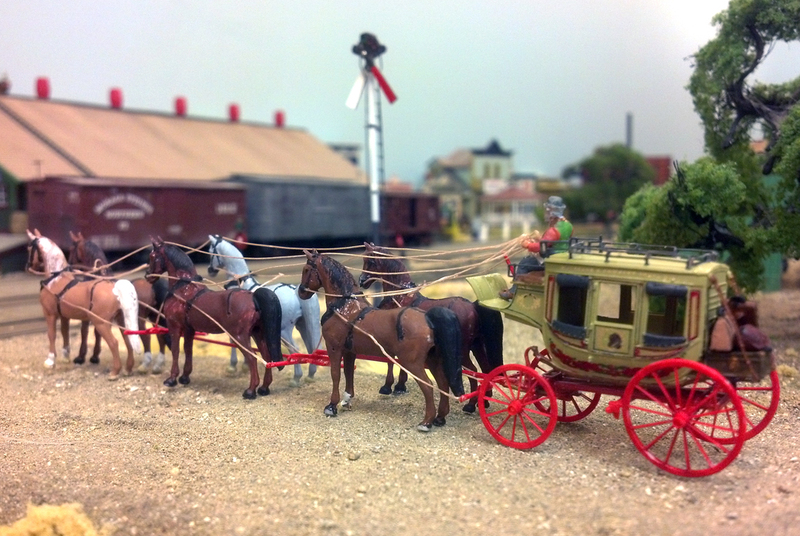 More Wagons and Stagecoaches, Too! This Matteson & Company stage was built straight from a Jordan kit. The decals were from Art Griffin (www.greatdecals.com/griffin.htm). Lately, the different types of wagons and carriages has been interesting me as much as billboard freight cars. There is a lot of variety in both areas and they are both fun. 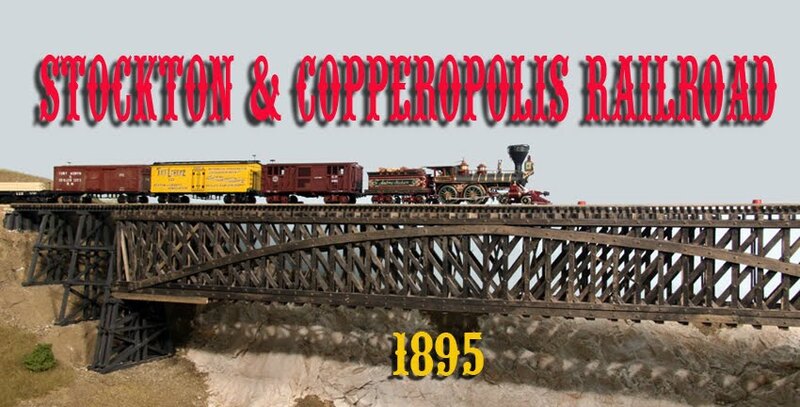 Jordan Products, and others, make a number of very nice wagons and carriages and those alone will furnish a nineteenth century railroad but there are a number of common horse-drawn vehicles that aren't represented. The last couple of weeks have been spent trying to reproduce some of these. While the passengers dither, the driver is obviously eager to start his trip. The horses seem to be indifferent. One of the biggest needs on the S&C is for stages. 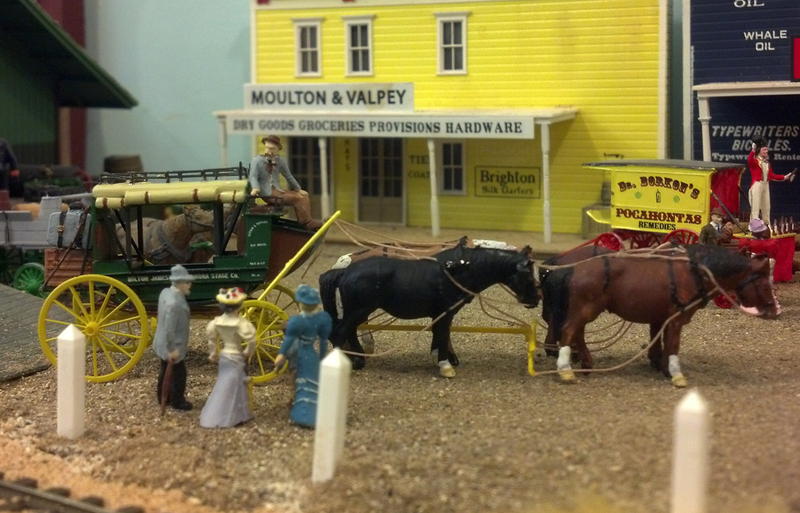 Stagecoaches met the trains at Milton, Burnett's, Peters, Oakdale and Farmington. Passengers changed from the steamcars to the stage to get to the mining communities of Sonora, Jamestown, Angel's Camp, Murphy's and the rest. While Jordan makes a beautfiul Abbot & Downing Concord coach, most of the California stages were what was lovingly called "mud wagons." This name came from two of its characteristics. The mud wagon were more heavily built than the Abbot & Downing coaches and, thus, better suited to the rougher California mountain roads. They were also cheaper by about half but were also more open affording little protection for the passengers from the mud and dust thrown up by the wheels. They could stand up to muddy roads but at the expense of a good part of the road landing on the passengers. My version of a mud wagon was based on an M.P. Henderson design. 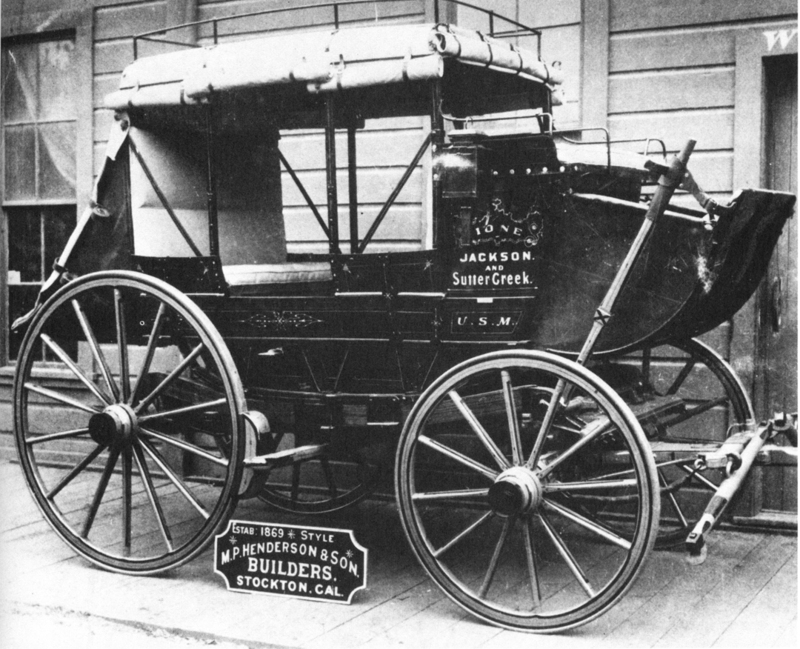 Henderson was located in Stockton and made wagons used throughout the West. I used a Jordan stage as a base and adapted the running gear to suit the sturdier coach. The body was scratchbuilt from styrene. Some of the Jordan parts were used such as the luggage rack on the rear and the railings around the top. The lettering was based on a photo of an actual Guerin & Nevils stage. That company served both Milton and Oakdale during my period and was a good choice for me. Harnessing of the coaches was done as described in my post of January 23 (http://sandcrr.blogspot.com/2014/01/wagons-galore-with-harnesses-too.html). Harnessing one horse is not too bad, two is a little harder but six is a bit much. I'm sure they were hard to drive as well. A surrey is a great carriage to go for a Sunday picnic. This couple is on their wagon complete with a picnic basket and what looks like a bottle of some adult beverage. The two-seater buggy was probably the most common carriage in the 1890s, at least according to the photos I have seen. The second most common seems to be a four-seater surrey. Jordan makes a great buggy kit but no surrey. I spliced two buggies together to get the body and made a top complete with fringe out of styrene. A housewife negotiates for a bottle of liniment from the Watkins salesman. 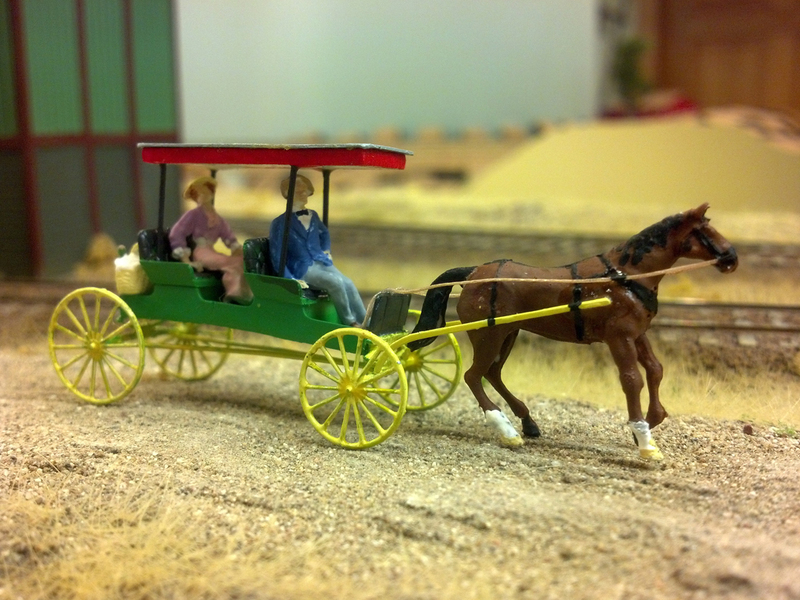 J. R. Watkins had many different kinds of wagons and are still in business today making such things as vanilla extract. None of it is now delivered in wagons, however. The last wagon I attempted this time around was a commercial sales wagon, sometimes known as a milk wagon. It was designed for in-town service where the driver would be alighting several times during the day, hence the drop floor. It certainly would not do on a rough road but would work fine on a graded city street. The body of this wagon was scratchbuilt with underbody parts from a Jordan Light Delivery wagon. The decals are from my artwork. Next up on the wagon front will be a dray. This was a low-slung cargo-carrying wagon used to move heavy equipment around. I photographed one at Old Sacramento several years ago and will try to reproduce it.